Watching fight scenes in films, particularly with superheroes, is always a tense experience which leaves you on the edge of your seat. Especially with all the special effects, CGI and green screens – it’s easy to get immersed in a reality which is so far removed from your own. So when the opportunity arises to see our favourite heroes fighting without all the special effects, you’d better believe I’m all here for it. And you should be too; a recent video shared on social media shows Chris Evans, aka Captain America, going head-to-head with Sebastian Stan, aka The Winter Soldier. And it’s pretty amazing. It’s easy to believe that the actors behind the superhero facade don’t actually have to do all that much, what with the masses of special effects that are available to them during filming. But now footage has emerged which disputes that belief, showing Evans and Stan engaging in an incredible fight choreography. 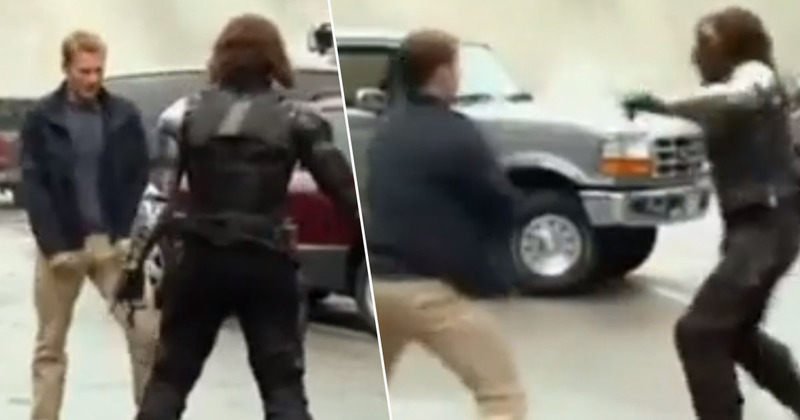 Shared by Reddit user SwitchTow, the video went viral almost immediately, with people speculating whether Evans was actually fighting Stan or his stunt double. As Stan – or his stunt double, James Young – has his face covered, it’s difficult to tell which of the men it is – whereas Evans, in his navy blue cardigan, is hard to miss. Isn’t the general rule of thumb you never put two actors in a stunt if you can avoid it? Chris was filmed against a double and then Sebastian was filmed against a double and the two takes were edited together. I heard this is done for safety because you want your stunt performer controlling the situation. Mostly though, people couldn’t get over Stan’s (or his stunt double’s) knife flick, which Comic Book reports the actor did actually learn during filming. Admittedly, it is very impressive. The footage was filmed during filming for Captain America: The Winter Soldier, although the next time we can expect to see Evans in action is in Avengers: Endgame. It’s unlikely we’ll see Stan’s Winter Soldier very soon though, because *spoiler alert* his character was among those who were turned to dust at the end of Infinity War. Regardless, I think everyone’s keeping their fingers crossed that the mass wipe-out of our favourite heroes was all just one big nightmare that will be forgotten about in the next film. No visual effects and still look at these guys!